It might be a bit strange to have an article about myself here as well, but I would like to give some more information about the process of the book I am writing. As you can read on the website, my book will be about the actions of the 9th Infantry Division between September 1944 and April 1945. The main focus will be the battles in the Hurtgen Forest between September 1944 and December 1944. It was during this period that the men of the Ninth fought some of the hardest, most brutal battles of World War 2. Only a hand full of books deal with the actions of the 9th Infantry Division. With all due respect, but most of the books dealing about the often overlooked Battle in the Hurtgen Forest describe the actions of the more well-known 1st, 4th and 28th Infantry Divisions. The 9th Division has been largely overlooked, while their efforts helped to secure the area and prevent the Germans from breaking through again. In this article you can read a bit about the research I have been doing. Writing a World War 2 related book with actual historic facts is not easy. Sure, you can read other books on the subject, copy a few action reports, add some pictures, and claim it to be a book. Believe me, these books exist! For my own research I have all the books that have been written on the Battle of the Hurtgen Forest. Some are great, others can be left unread. After years of research I am now able to pick out the source material that these authors used for their “book”. It became clear to me that most of these authors used the same source materials, and it’s clear in their writing. A lot of chapters deal with the same information, in different words. What I wanted to do with my book, is to create a valuable historic document that would explain all the actions of each unit of the 9th Infantry Division that was involved in the Hurtgen Forest battle, and have as many personal stories of the men who were there as well. I don’t just want to write a book, I want to write unique historical information that can be used by military enthusiasts or family members of veterans who fought in the Ninth in this battle. Where others have stopped looking for information, I started digging extra deep. And it paid off! I now have hundreds and hundreds of pages of unique documentation of all aspects of the 9th Infantry Division. I hope I will be able to process it all into a good readable story in the form of a book. My desk where I spend hours doing research. Besides books, folders and reports, I have pictures of several 9th Infantry Division men watching over me. Before I had the idea to write a book, I was interested in World War 2 history. After I heard about the Battle of the Hurtgen Forest, I started to write letters to the National Archives. The archives have all the reports that were typed out during and right after the war. Their information is very valuable. They have the so called “After Action Reports” for every month. These have information about the daily events for that month, and it is amazing how accurate the texts in these are. They also contain coordinates of places and positions, and tracing these areas back 68 years after the war is a unique experience. Can you imagine reading about a certain battle, and actually walk in that very same area, seeing the holes in the ground where the men used to live, fight and sometimes die in? This makes an everlasting impression on anyone. So, for the last 10 years I have been collecting various reports via the Archives. I also have received reports from family members of veterans who have been very supportive of my project. Sometimes I would receive more than I could have hoped for. 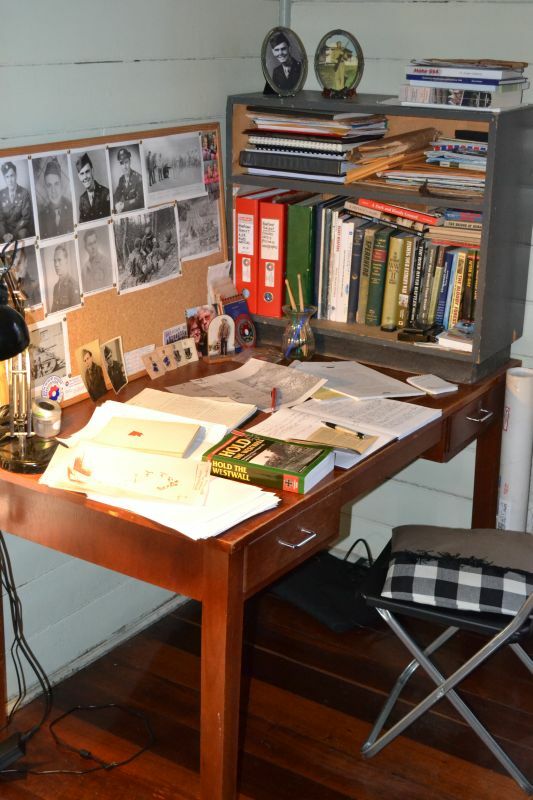 Written notes by veterans, copies of maps used, rosters, or personal letters and photographs. Some of the veterans even send me their insignia’s or uniform items! All of this is very special to me, and each item helps me in slowly getting the complete picture clear. Besides these reports and personal gifts, I have obtained very hard to find, out of print books about the 9th Infantry Division. Official Unit booklets and histories, or privately published memoirs of men who fought with the Ninth are often valuable information sources. I spent a lot of time on auction websites to find and buy these books. I am proud to say that I now have a huge collection of these books, and I am still collecting and searching for more of these. Can you imagine how touched I was when the official 9th Infantry Division historian Red Phillips contacted me, praised my dedication and mailed me some of his books to keep to help me in my research? Wonderful! Sometimes I wonder what I am doing! All the efforts I make to retrace the steps of these men and to gather all the information of events so long ago. The events I am researching are not the nicest things to read about. It involves brutal battles and fighting, the loss of lives, the pain and nightmares that some veterans still carry with them. It can get to me sometimes. In those moments I step away from the research for a few days, and read some books completely unrelated to war, and clear my mind. However, my passion for research and finding everything out about the Ninth is great. I enjoy doing research, and I will always keep on doing it. Sometimes it feels like I can’t continue because I can’t find a certain piece of information. It then can take weeks or months to find the missing link. When you have found the answer, it feels like another victory, and I move on to the next bit of research. I know how much time, effort and emotions it takes to do this and moments like those little discoveries are just great! I advise anyone who is serious about their research to contact the National Archives and start requesting the documents they need. I am sure the satisfaction they will feel when they receive the information is worth a lot. To see your collection and personal archive growing is great. I think this is part of the whole passion and idea behind doing research. Many people don’t realize it takes years to build up trust and maintaining this trust and friendships with the contacts I have made during the years. I will be happy to help any family members to information if I have it. The reason for writing my book are the brave men who fought for my freedom. The veterans of the 9th Infantry Division. No matter if they have died during the war, are missing in action, or are still alive, they are my biggest inspiration in all of this. Over the years I have created some wonderful friendships with some of these veterans and their family members. I have tested some of their memories to the fullest by asking them questions about times they rather do not talk about anymore. But each of them have opened up for me, and lay their trust in me. This is something I will never forget, and am very grateful for. It is wonderful to be in touch with these men. To hear their stories about the war, but also about their lives today. Anything they shared with me is priceless, and means the world to me. You can imagine the sadness I feel whenever I receive the message that one of them has passed away. Everyone in this world should recognize what these men have done for us and our families, so we can now live in freedom. To me they truly are “The Greatest Generation”. Their help and support has given me so much inspiration to get this book finished. A lot of the family members of these men have been great as well. Wherever they can help, they have provided me with information about their father, grandfather, brother, uncle or great uncle. The fact that they trust me and provide me with personal stories and pictures is something I never would have expected when I started my research. I now count some of these people as my best friends. Thank you, each one of you! 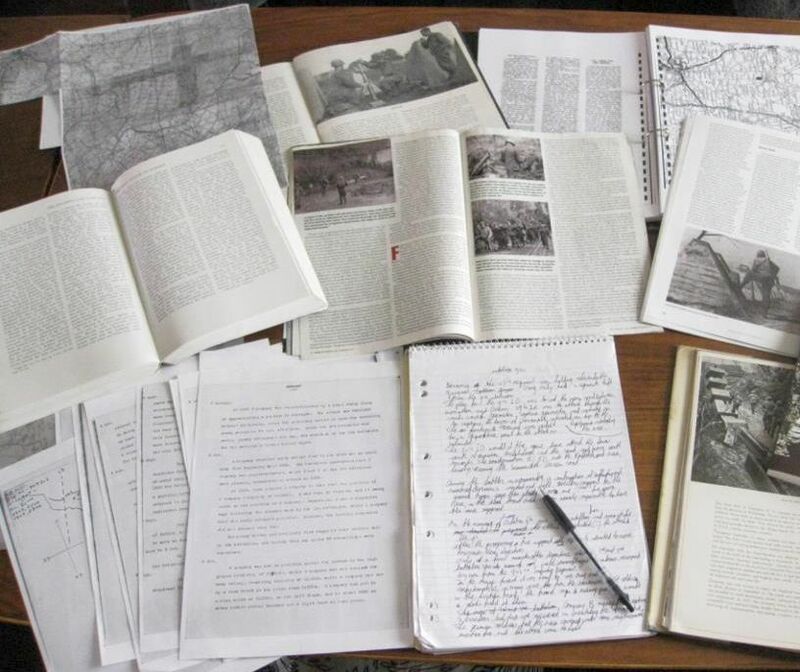 A typical view of my desk when researching and writing! Over the years a lot of family members have contacted me to help them to find some answers about a loved one who served with the 9th Infantry Division. I often manage to find out in what Regiment a soldier fought, where he was killed, or can provide them details of the areas where they have been during the war. Even when a soldier survives the war and passes away because of his old age, I feel honored to be in touch with these family members, and provide them some information. I have been very proud to say that I have been able to reconnect veterans who lost touch with each other over the years, or to get family members and veterans in touch with each other so they can provide additional details to one another. I also visit graves of a loved one, place flowers, take pictures of this, and let the family know their loved one is not forgotten. Many people don’t realize that in order to understand a certain battle, it is important to understand the setting of the battle. I find it very important to visit the area of the Hurtgen Forest as much as possible. Not only because of the beauty of the forest today, but because of the history. Traces of the 6 month battle in the forest are visible everywhere. Craters, foxholes, rebuild villages, war relics and the cemeteries are silent reminders of the battle days. To walk in the area where these men walked as well is an experience I can’t explain. To see the remnants of a former German trench, looking peacefully in the landscape today, knowing it caused a lot of trouble to the men who had to fight days to overrun a position like that is just something impressive. Visiting the area gave me an understanding of the battlefield. I slowly understood why a certain road junction had to be taken, or why a certain village was important. I understood why the Field Artillery was situated where they were, and why the support of Armored vehicles and tanks was basically impossible in certain parts of the forest. While visiting the area I have met up with various people who live in the area and who by now became my friends as well. I like to thank my dear friend Ton Aalbers for always joining me on these trips. He’s a great company! We learn new things from them every time we visit the Hurtgen area. Another person I need to thank, is my dear dad, André. Ever since I was a young boy, he took me to many places related to World War 2. We still make these trips every year, and they are always very special to me.